There is no doubt that social media has now exploded into a global phenomenon that enables companies to share product information, build brand awareness, and connect with customers much more efficiently than ever before. While companies have always worried that they could not absolutely control its content or use by employees, new threats have recently emerged; hackers can penetrate company systems through social media sites, and applicable regulations can be violated more easily through inadvertent sharing of privileged content. 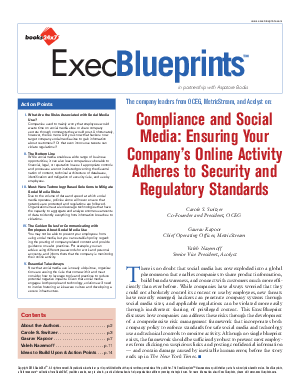 This ExecBlueprint discusses how companies can address these risks through the development of a comprehensive risk management framework that incorporates both company policy to enforce standards for safe social media and technology use and technical controls to monitor activity. Although no single blueprint exists, the framework should be sufficiently robust to prevent most employees from clicking on suspicious links and posting confidential information— and contain damage caused by inevitable human error, before the story ends up in The New York Times.